Toyota's Stephen Beatty will deliver the opening remarks at the Great Lakes Economic Forum. 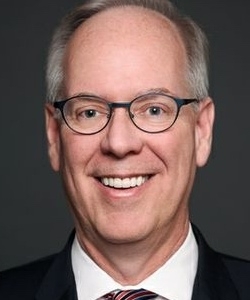 Toyota Canada Vice-President Stephen Beatty will deliver a speech on climate change at the Great Lakes Economic Forum in Windsor, Ont., April 24. The automaker paid $35,000 to be the title sponsor of the annual event and Beatty will deliver the opening remarks. “The Great Lakes region is an epicentre for experts in the areas of IT, marketing and manufacturing, and the collaboration among these sectors are pivotal to the changing retail environment,” he said. Beatty cited Toyota’s Cambridge and Woodstock facilities as examples. Toyota started as a small plant 30 years ago, making only 50,000 cars per year. Today, the two plants combine to be the second largest Toyota manufacturing facility globally, building more than half a million vehicles a year. As a result, Toyota is a net exporter of vehicles in Canada. Ontario Premier Kathleen Wynne has spent time in the early part of 2017 reaching out to governors in Michigan and Illinois, convincing them of the importance of the integrated auto industry. The Canadian Automotive Parts Manufacturers’ Association recently completed a survey of its members and found that Canadian suppliers own 150 facilities in the United States and that 81 of those are in Great Lakes states. Canada’s Minister of Innovation, Science and Economic Development, Navdeep Bains, will also deliver a keynote address to the forum. Mick Mulvaney, director of the White House Office of Management and Budget will do the same.